Stone: Natural Garnet Deep Dark Red -The natural properties and composition of mined gemstones define the unique beauty of each piece. 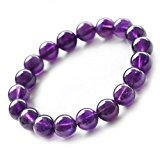 Bracelet length: 7 - 7.5 inch-Stretchy Approx. 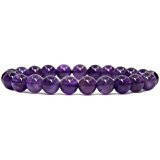 Bead Size- Available in: 8,mm- 23-24 Beads and 10mm- 19-20 Beads Approx. Amethyst, the birthstone of February, is a variety of Quartz that carries a spectacular purple color that ranges from a blend of deep violet and red to a lighter lilac hue. Ancient Greeks believed that the stone protected the wearer from drunkenness and enabled them to keep a balanced mindset.